You might remember back in the old days* when I never included people in my shots. While I was waiting on the light rail, I glanced around to see what I could find to photograph. The sun through the shade fabric made a nice silhouette of those two shoes, so I was content. I made this shot twice; the first time with my usual no-people composition. Then this guy walked into the shot. I made the picture. And then – this is where it starts to get weird – I actually liked it better than the first image. I hope I am going to be OK.
PS: Don’t forget to click on the image to see a larger version! 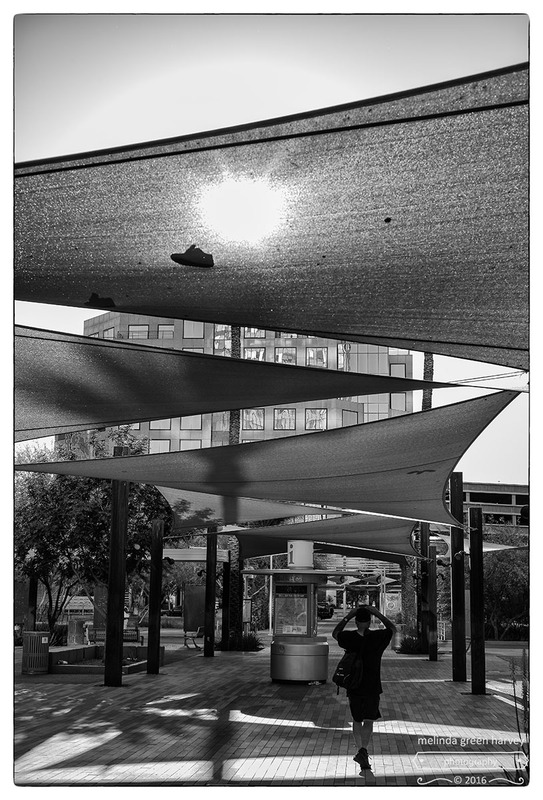 Posted on April 24, 2016, in Photography and tagged 365 photo project, black and white photography, downtown, Leica, melinda green harvey, monochrome, one day one image, Phoenix, Phoenix Arizona, photo a day, photography, postaday. Bookmark the permalink. 18 Comments. Great Photo! The shoe reminds me of a jetski on the water, so it feels the picture is about work and play. Now that you mention it, that shoe DOES look like a jets! Good eye. Heartless of you. There the person was, in complete surrender, begging you not to shoot, and what did you do? Shot. And then you liked it! You’ll never be the same again, Melinda! I like the photo, too. However, if you’re still questioning your own judgement, I know they are doing wonderful things with the new psychotherapeutic drugs. Thanks, but I think I’ll pass on the drugs. I don’t want to risk this delightful*, quirky* sense of humor. Thanks, Laura. It’s no golden hour Golden Gate that you shoot, though! You’re welcome. :). And hey, it’s hard to take a bad picture of the bridge! The bridge makes it easy. Great shot ! With the arms over the head maybe the person is feeling sad for the shoes. I know a good therapist. But don’t recommend it. I like it! Also like the shadow of the shoe and what looks like a banana peal on the awning. It’s a slippery slope from pure sculptural architectural shots to dirty street photography…you’ll find yourself unable to shoot without people, but of course you’ll still resist letting anyone know you’re taking their picture. Oh, the humanity! I just got a less-intrusive camera than my big DSLR, and I can already feel the itch to do more street photography…we’ll see where this leads me, I guess!